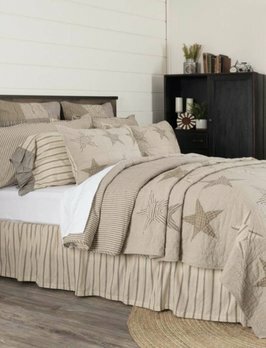 Sawyer Mill Star Charcoal Quilt brings a refreshing farmhouse style to your country home! Featuring stitch in the ditch and channel hand-quilting on textured solid chambray cotton. Showcasing several rows of 5-point stars in alternating colored fabrics. Show your farmhouse style with the Sawyer Mill Charcoal Ticking Stripe Quilt Coverlet. Available in Twin, Queen & King. Features vertical channel hand-quilting with repeating ticking stripe woven into solid cotton base. Reverses to a solid cotton. 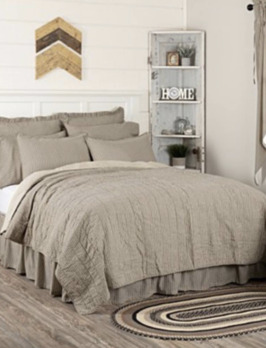 Get cozy in your farmhouse style bedroom with the Sawyer Mill Collection and this Sawyer Mill Bed Skirt. 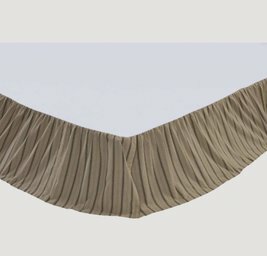 The skirt's graceful 16" drop and gathered ruffle is preceded with dark creme and charcoal grey stripes. Available in 3 sizes.